Opa! The Magic City will experience the excitement of the 45th Annual Birmingham Greek Festival on September 21-23, 2017 from 10:30 a.m. to 10 p.m. The Ladies Philoptochos Society began the festival in 1972. Thousands of people from all parts of Alabama, Mississippi, Georgia and Florida now flock to downtown Birmingham for the big event. If you’re looking for fun things to do in Birmingham, you do not want to miss out on this. There will be live music, dancing and delicious eats. As soon as you step onto 19th Street South, you’ll hear the band playing traditional Greek music. Once you arrive at the festival, you’ll be enveloped in a warm atmosphere of lively joy. The main stage will have intervals of Greek music, authentic Greek dancing and DJ/crowd interaction throughout the entire weekend. The Greek dancers include children and youth from the Holy Trinity-Holy Cross Greek Orthodox church as well as professionals from around Birmingham. The festival also provides you with the chance to tour the breathtaking Holy Trinity-Holy Cross Greek Cathedral. Church members will give tours between 5 p.m. and 9 p.m. on Thursday and Friday as well as between 10 a.m. and 9 p.m. on Saturday. It wouldn’t be a Greek celebration without an abundance of scrumptious Greek dishes and pastries. Local chefs and members of the church make all of the food from scratch. Every year, people rave over the delicious Greek chicken. To fulfill your sweet tooth cravings try the Baklava or the Loukoumathes (yummy doughnuts). If you don’t have time to enjoy all o f the festivities, don’t worry! There’s still a chance to have a delightful meal. The festival operates a drive thru everyday from 10:30 a.m. to 7 p.m. Admission to the event is free. By purchasing the food or any of the imported goods at the market center, you will help make many Birmingham neighborhoods better. The proceeds from the festival go to local charities such as Magic Moments, The Exceptional Foundation, The Ronald McDonald House and many others. 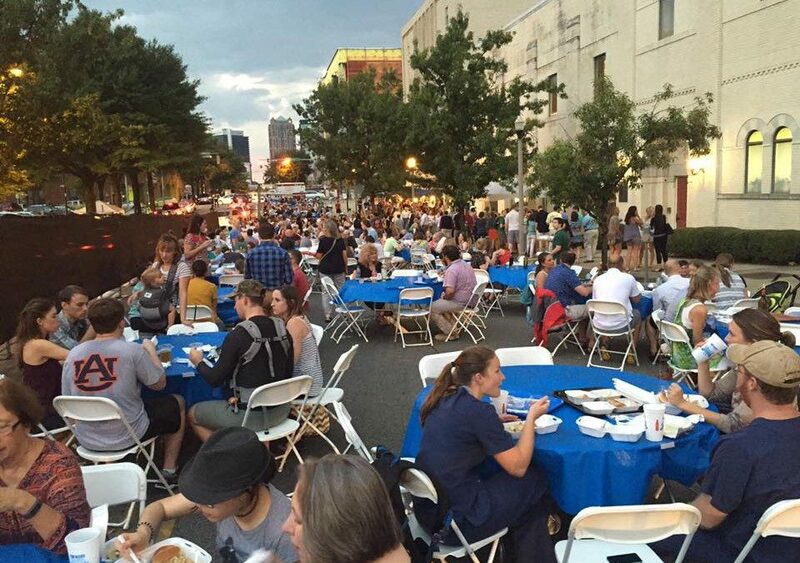 All photos courtesy of the Birmingham Greek Festival.